The river is very narrow and fast flowing at this point, therefore competitors start in batches. The top 30 paddlers will start as they finished on the first day at elapsed times behind the leader in the yellow jersey. Return to the tar road and turn left towards Tulbagh. Turn left towards Gouda / Porterville. 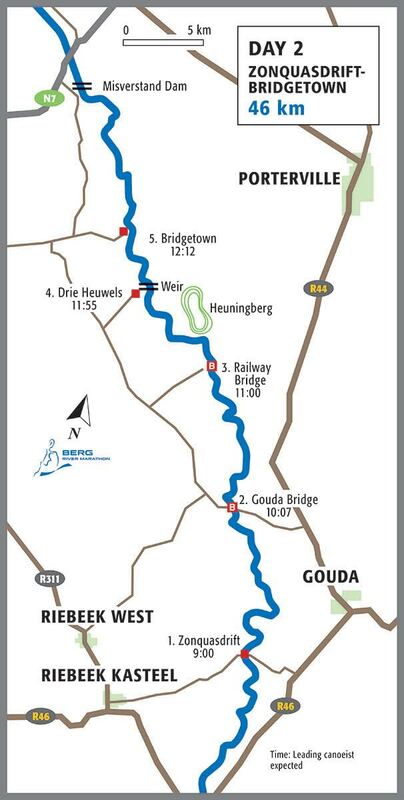 Drive past Gouda and turn left towards Moorreesburg on a dirt road. It is advisable to park on the main road and watch from the bridge. Follow the dirt road toward Moorreesburg all the way to the turning after you have crossed the railway line. If you are towing a caravan rather carry on towards Bridgetown or leave it at the gate. This is a beautiful spot. Close the gates. Only enter if the farm gate is unlocked. Close the gate behind you. Follow the dirt road towards Moorreesburg until you join the tar road and turn right towards Bridgetown. Follow the tar road for about 4km and turn right onto a dirt road at the gate towards Bridgetown. Enjoy a most fantastic view up the river from the lawns in front of the bungalows. A great picnic spot.